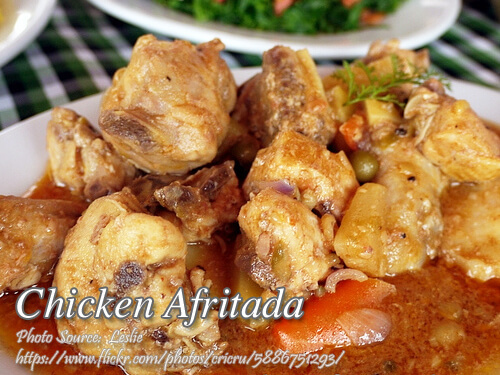 Chicken afritada is one of the many Filipino tomato based stew. In this case, it is a tomato based chicken stew. Obviously the name of the dish has some Spanish origin like many other Filipino cuisine with tomato sauce like the calderata or menudo. This dish contains vegetables like potatoes, carrots, bell pepper, green peas or chick peas and of course to make it more savory, grated cheese was added. One advantage of cooking this dish is the less cooking time involved because it uses chicken meat instead of red meat like pork or beef. You can use almost any parts of the chicken depending on your preference. To cook chicken afritada; Saute garlic and onion until fragrant. Then add the chicken and saute for 5 minutes. Add patis and stir cook until the patis has evaporated, then add the tomato sauce and water. Bring to a boil then simmer until the chicken is tender and almost cooked. Add carrots and potatoes. Simmer again until carrot and potatoes are cooked.Add the cheese, green peas, black pepper, bay leaf and bell peppers and simmer for another 3 minutes. Chicken afritada is one of the many Filipino tomato based stew. In this case, it is a tomato based chicken stew. Saute garlic and onion until fragrant. Then add the chicken and saute for 5 minutes. Add patis and stir cook until the patis has evaporated, then add the tomato sauce and water. Bring to a boil then simmer until the chicken is tender and almost cooked. Add carrots and potatoes. Simmer again until carrot and potatoes are cooked. Add the cheese, green peas, black pepper, bay leaf and bell peppers and simmer for another 3 minutes. Serve hot. I tried your chicken afritada yesterday and I was not disappointed. In fact it was delicious and as I’ve expected! Thanks for the recipe! Hi Eddie, I’m glad it turns out well. I hope you will also try my other recipes as well!